Understanding how patients with cancer respond to treatment is key to building a health care system that continuously learns how to deliver safer and more effective cancer treatments. Clinicians need to evaluate how groups of patients with a specific diagnosis respond to a treatment protocol in order to improve the protocol. Cancer researchers need to tie the results from their investigations to clinical data in order to drive development of new cancer treatments. The barriers to conducting these analyses are common across all hospitals. Two of the main barriers are that patient data is scattered across many disconnected systems and buried within dictated notes, requiring lengthy manual processes to collect the data in one location and that outcomes, i.e. measures of how well a treatment works and how well the patient can tolerate the treatment, are not captured at the point of care in a consistent fashion across the program. The Cancer Informatics (CI) team has built tools to break down these barriers and enable a learning health system at Princess Margaret Cancer Centre. 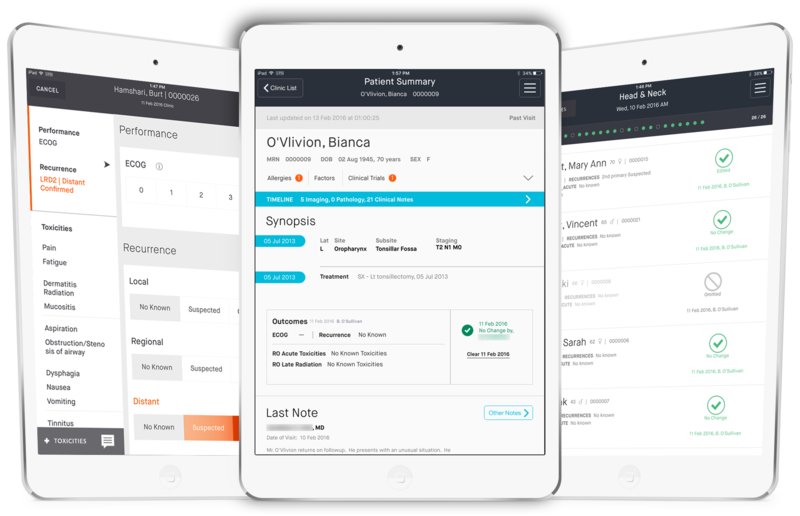 The CI tools collect clinical information from multiple sources and present the key clinical context – diagnosis, treatments, patient predictive and prognostic factors – to clinicians in a concise format on a mobile platform. Using the same mobile platform, the clinician can then record outcome data (overall patient well-being, treatment success or failure, adverse events, etc). The outcome reporting tools have been structured to use the same basic framework for all types of cancer while allowing specific configuration for each disease type. We are currently deploying the CI outcome capture tools to a small number of disease sites. A team of health information specialists is actively pulling clinical context out of dictated notes and entering it into the CI database. The development team has started integrations to pathology, biobank and genomic systems in order to build a comprehensive record for scientific research. We are learning from our initial deployment and pilots, with plans to expand the rollout to additional disease sites and to build tools for clinical and scientific researchers.